The chief service of God is to preach the Gospel. For we do nothing but teach the word, believe, and pray. But when we do this, wonderful things follow. The following are the top 20 frequently asked questions about our congregation to help you better understand what to expect if you were to join us for our Divine Service on Sunday. Who is welcome to visit your church? What is it like inside your church building? Why does your pastor wear a robe and a collar? Why do you carry in a crucifix and light candles? Why are there Latin words used in the bulletin? Why do you call your gathering a Divine Service? What kind of structure does your gathering have? Will there be responsive readings from the Bible? Why do people stand when the Gospels are read? Why do you read ancient creeds and a catechism? How can your pastor say that my sins are forgiven? Why does your pastor talk about Baptism so much? Am I allowed to take Communion when I visit? Are young children expected to participate? Do you have a play area if my toddler is restless? 1. Who is welcome to visit your church? Because Jesus died and rose again for all people and has given His Church the privilege of making disciples of all people by baptizing and teaching [Matthew 28.19-20] and invites all repentant sinners to come to Him [Matthew 11.28-29], all people are welcome at Faith. 2. What is it like inside your church building? You can get a good idea of what our church looks like from the pictures on our website. You will notice, though, that although the building exterior looks very old—many compare its looks to a castle—the inside is a bit more modern. That is actually a beautiful symbolism for the holy Christian Church: although she is very old she is also contemporary, living in the world today. The windows on the side of the main part of the church, called the nave, depict the various parts of the Lord’s Prayer. You will also notice that your eyes are attracted to the front of the church to the altar. That area is called the chancel. The altar looks like a table and it is called an altar to remind us of Jesus’ sacrificial death on the altar of the cross. Our altar is not a table of death on which a sacrifice takes place. Instead, it is a table of life where Jesus gives us His crucified and risen body and blood in Holy Communion. The altar is dominant and symbolizes the fact that Jesus is truly in our midst just as much as He was in the midst of His disciples on the very first Easter Sunday evening, showing them His wounds, and announcing and giving to them the forgiveness of sins: “Peace be with you.” [John 20.19-23]. To the right of the altar is the pulpit. Our pastor preaches from the pulpit. It serves as a visual reminder that in this congregation and from that place the authoritative word of God determines all that we teach, believe, and confess. To the left of altar near the communion rail is the baptismal font. Here is the visual reminder of our own Holy Baptism. Here it stands calling us to drown our old sinful nature by sorrow over sin and in faith to receive again the forgiveness of sins Jesus freely gives us. In that joy of forgiveness and in the power of the Holy Spirit who is given us in baptism, we then strive to live a righteous and pure life. Above the altar you will then see a cross suspended. Here we are reminded that the forgiveness of sin, life, peace and joy that Jesus gives us in His Word and Sacraments has been brought about by His suffering and death on the cross for us. 3. Why does your pastor wear a collar and a robe? What a pastor wears is a matter of Christian freedom; the Bible doesn’t prescribe one thing or another. However, certain things are more conducive than others for our worship and service. Our pastor will generally wear his clerical collar while carrying out the duties of his office. This makes it clear to both pastor, parishioner, and any on-lookers that the pastor is not representing himself but Jesus Christ. In the Old Testament times the priests were directed to wear certain vestments. The early Church, following this practice, also used clerical vestments. They did not always look the same but by the sixth century the tradition was established. One purpose of the vestments is to cover the individuality of the pastor. Our pastor wears the vestments of his office as a minister in the Church. The vestments remind us that he holds this office for the people of God. At Faith, our pastor wears a cassock and surplice during the festival half of the Church Year. The cassock is a long black robe that is buttoned up the front. At one time it was the street dress of priests. It is a basic garment and symbolizes with its black color our problem of sin and our need for Christ. The surplice is a knee-length white flowing garment that reminds us of our baptism and the purity of Christ we receive through the Sacrament. During the Non-Festival Half of the Church Year our pastor wears a long white ankle length robe called an alb. It has its roots in ancient baptismal garb and was often worn by baptized Christians in the early Church. It is tied by a rope belt called a cincture—a symbol of the whip under which Christ suffered in His passion. Using the historic vestments of the Church are symbols of the historic continuity of the Church with those who have gone before us from every time and place. 4. Why do you carry in a crucifix and light candles? The cross, the most important of all Christian symbols, symbolizes Christ and His death on the cross and the redemption of humankind. Viewing the crucifix serves as an aid to our devotion. Missouri Synod liturgical scholar, F. Lochner, notes: Because the cross is the oldest of all the symbols which the Christian faith has produced as its most fitting witness, the crucifix rightly adorns our altar. It is analogous to the bronze snake that served as a model of the coming Messiah so long as it was used in Israel only as a remembrance and not as an idol [Numbers 21.4-9]. In fact, no other symbol surpasses this sign for the complete redemption and atonement of the world; and this sign is unsurpassed in preaching it and its reception through faith (John 19.30; John 3.14, 15; 2 Corinthians 5). We have a procession with the crucifix at the beginning of our service and at the end. As we process in with the crucifix, we are reminded of Christ’s presence with us in worship [Matthew 18.20; Exodus 3.1-5]. As we see the crufix during the service, not only are we reminded of Christ’s presence with us but that we are receiving in the Word and Sacrament the blessings He won for us by His death on the cross. As we see the crucifix processing out of the service we are reminded of Christ’s presence with us as we go out into the world [Matthew 28.20]. The candles around the altar are liquid wax candles which is a reminder of the early Church’s [and the Old Testament Temple’s] use of the oil lamps and lampstand [Exodus 25.31-37; Zechariah 4.2]. 5. Why are there Latin words used in the bulletin? We follow the traditional liturgy of the Western Church. The liturgy is a wonderful gift that we are blessed to use because it directs our attention away from ourselves and the world and focus our attention on Christ. The liturgy is something that developed over the history of the Christian Church. Having its roots in the worship of the Old Testament temple and in the synagogue [for example, Hebrew words like “Alleluia”, “Amen” and “Hosanna” still form part of the liturgy as do the Psalms], various ages and places [like Greece, the Middle East, North Africa, Europe and now America] to which the Church spread have added their input so that the liturgy is something that is truly universal. At the time of the Reformation, Luther kept the liturgy of the Roman Church, merely cleansing it from abuses that crept in that turned the focus away from Christ and His work. Because the language of the liturgy was Latin, the Latin names for many parts of the liturgy remained after it was translated into the common language of the people. The Latin names/words that you find in the bulletin are a wonderful reminder of and a connection with Christians from the past and from the different corners of the world. 6. Why do you call your gathering a Divine Service? Our worship service is called the “Divine Service” because as we gather together around the altar and pulpit, God Himself—the Divine— is serving us with His holy Word and Sacrament giving us the forgiveness of sins. Notice, the focus of our worship is not on us and our feelings. The focus of our worship is on the Lord. We are in His midst. When He comes to us, we are standing on holy ground [Exodus 3.5] and He comes giving us the greatest possible blessing: the forgiveness of sins [John 20. 19-20]. 7. What kind of structure does your gathering have? Our services follow the traditional liturgy of the Church. The Service of Holy Communion begins with the Preparation. Here we come before God as His own beloved children and confess our sins and receive forgiveness of those sins. The service continues with the Service of the Word. Everything in the service centers around the word of God. It begins with the Introit [you can kind of see the word “entrance”] which a usually a number of verses from Psalms that help set the theme for the day. Also in this part of the service, recognizing we are in the Lord's presence, our attention focuses on Him and His glorious work of saving us and we praise Him using the words of the angels at Christmas: Glory be to God on High [Luke 2.14]. After praying a prayer [Collect] the Church has prayed for centuries which sets the theme for the day, we hear God speak to us in the Scripture readings. After hearing God’s word, we then confess our faith using one of the three creeds of the Church: Apostles’, Nicene, or Athanasian. Then comes the sermon which is an exposition of one of the readings for the day that was just read. After the sermon is the offering and the Prayer of the Church. In the just concluded Service of the Word faith has been awakened and strengthened. Now, in the third part of the service is The Service of the Sacrament, God joins His act and deed to His word. Here we recognize that we are not alone but we are joining our praise, not only with our fellow Christians here, but we are “breaking into heaven” and joining our praise with the “angels, archangels and all the company of heaven”. In the Sanctus, we sing the praises of the Seraphim [Isaiah 6.3] and join our praises with the Palm Sunday crowd [Matthew 21.9; Psalm 118.25]. They welcomed Jesus riding the humble donkey—we welcome Jesus “riding” the simple bread and wine, giving us His body and blood. Also here are the Words of Institution [1 Corinthians 11.23]. This is not a mere historical recitation, but Jesus Himself speaks and designates, marks this bread and this wine on the altar as that with which He will join His body and blood. Before receiving the Sacrament, we again recognize and confess that Jesus is indeed present with His body and blood as we join John the Baptizer and point to Christ in, with and under the bread and wine and confess, There! In that bread and wine is Christ, “the Lamb of God, who takes away the sin of the world!” [John 1.29] Here in this sacramental means of grace He gives us the forgiveness of our sins. After receiving the Lord’s body and blood, we join our praises with Simeon [Luke 2.25-32]. Like Him we have received the Messiah in the flesh and having enjoyed this gift we are ready to leave God’s holy house and enter the world again. After a prayer and responses, the service concludes with the benediction. 8. What kind of music is sung during your worship? We sing the traditional hymns of the Church. Like the liturgy, the hymns reflect the universality and age of the Church. For example, the oldest hymn we have in our hymnal is “Shepherd of Tender Youth” written by Clement of Alexandria [in Egypt] who lived about 200 AD. All the different periods and times of Church history are represented by the hymns. Of course, we have quite a large number of hymns from the period of the Reformation and afterward. And we have a number of hymns from England and America. We use the traditional instrument to accompany congregational singing—the organ. 9. Will there be responsive readings from the Bible? What we hear and do in worship on Sunday influences our daily life and becomes part of the rhythm of our lives. St. Paul, in Ephesians 5.19-20, describes Christians as “addressing one another in psalms and hymns and spiritual songs, singing and making melody to the Lord with your heart, giving thanks always and for everything to God the Father in the name of our Lord Jesus Christ.” In the liturgy, the “back and forth” between the pastor and people is mostly Bible verses. This weekly repitition helps to “ingrain” Scripture into our hearts. This “back and forth” between pastor and people also takes place on a “larger scale” as each week there are responsive readings from the Psalms which are printed in our bulletin. In the Communion liturgy, this takes place with the Introit at the beginning of the service of the word, which helps set the tone for that particular Sunday. There is also a shorter responsive reading, called the Gradual, before the reading of the Gospel. This serves as a bridge between the Gospel and the reading that comes before. In the prayer services—Matins and Morning Prayer—Psalms form a main section. These services come to us from the monasteries in which the monks would pray together all the Psalms over a certain period of time. The Psalms are very conducive for reading responsively as they are Hebrew poetry. The Psalms “rhyme” in ideas. When our pastor reads a part of a Psalm, the congregation hears it and says back a “rhyming idea”. This is one way that we can grow in the faith and our understanding of that faith and learn to speak the language of faith. 10. Why do people stand when the Gospels are read? Although all Scripture is the word of God, in the Communion Service we stand when the Gospel is read. By that we are recognizing the uniqueness of the Gospel for there are recorded the very acts and words of our Savior Jesus Christ; there are recorded the very acts and words of God when He became man. By standing, we are showing respect for Him—like people stand when someone important steps into the room—and wish to give all our attention to His words and deeds recorded by the holy writers. 11. Why do you read ancient creeds and a catechism? “Creed” comes from the Latin word “credo”—“I believe.” The creed is confessed after the reading of the Gospel. The creed says back to God what He has just told us in His word. It is our acceptance of and saying in summary form what it is that the Church believes. The creed is a “bird’s-eye view” of the faith before we turn our attention to one aspect of that faith in the sermon. Though probably not from the apostles, the very ancient Apostles’ Creed, certainly contains the doctrine the apostles taught. It is known as is the “baptismal creed” of the church and is generally used in non-communion services. The Nicene Creed from the 4th Century came about because of a heresy that denied that Jesus is true eternal God. This creed was accepted by the whole church in council. Because it represents the united faith of the true Church, it has been traditionally used for Communion services because in the Lord's Supper we are united in Christ and with one another. The much longer Athanasian Creed nails down the two more difficult teachings of the Christian faith—the doctrine of the Trinity and the doctrine that Jesus is both true God and true man. It is confessed on Trinity Sunday because of it clearly defining the doctrine of the Trinity. 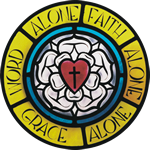 At Faith, we also go through Luther’s Small Catechism during the second half of the Church Year, which runs from about June until the end of November. The first half of the Church Year deals with Jesus’ life; the second half with His teaching. During this “teaching” half we refresh ourselves in the basics of the Christian faith by yearly going through the catechism. 12. How can your pastor say that my sins are forgiven? Jesus gave the authority to forgive sins to His Church. Each Christian has the authority, then, to announce the forgiveness of sins to the person sorry for sin [Matthew 18.15-18]. The congregation has entrusted that authority to forgive sin publicly, that is, in the name of the congregation, to the pastor; the congregation has called the pastor to announce to it the absolution, which is the forgiveness of sins. 13. Why does your pastor talk about Baptism so much? Holy Baptism clothes us with Christ [Galatians 3.27]; it connects us with Christ’s death and resurrection [Romans 6.3-4]; it forgives us our sin and gives us new spiritual life—faith [John 3.3-8; Titus 3.5-7]; in short, it saves us [1 Peter 3.21]. Because baptism is foundational for the Christian life, because it is the “frontier sacrament” by which we enter the Church, so much depends on it. It is not a one time event with no meaning today; instead, it gives meaning to our lives daily as it tells us who we are and Whose we are—dear children by grace of God. Because it gives us the blessings of forgiveness of sin and eternal life, we need to keep hearing of it and what it is and does, lest in the day-in-day-out struggles of every day life we forget what it is and its blessings and be deprived of them. 14. Am I allowed to take Communion when I visit? In the Blessed Sacrament, Jesus gives us great spiritual blessing as He gives us His body and blood for the forgiveness of sin [Matthew 26.26-28] and the strengthening of faith. But because Jesus is truly in, with and under the bread and wine [1 Corinthians 10.16; Matthew 26.26-28; 1 Corinthians 11.27-29], it is not just bread and wine but Jesus’ very body and blood—the very body and blood of God. All who receive this sacrament, receive the true body and blood of Christ. That means that some can receive it not for their spiritual good but to their spiritual detriment [1 Corinthians 11.27-29] if they receive it unworthily. In love for all, we invite those to receive whom we are reasonably certain are able to examine themselves [1 Corinthians 11.28], recognize their sin, and recognize their Savior from sin and that He Himself is present in the sacrament giving His body and blood for the forgiveness of that sin. When a person is a confirmed member of a congregation of Lutheran Church-Missouri Synod, we can be reasonably certain that is the case. Also, the Sacrament is a confession of faith [1 Corinthians 11.26; 1 Corinthians 10.17]. By it we are saying that we agree in doctrine with what is taught from the pulpit and with those we are communing with. Because of our care for your spiritual well being and because of the oneness of doctrine being confessed in this sacrament, we commune those who are confirmed members of a congregation of the Lutheran Church-Missouri Synod and those church bodies throughout the world that are in altar and pulpit fellowship with the Missouri Synod. 15. Are young children expected to participate? Absolutely! Will young children know exactly everything going on? Hardly! But that’s part of growing up in general and that’s part of growing up in the faith. Parents by bringing children week in and week out to church are teaching their children how to worship; they are teaching them the faith; they are using church and what goes on as opportunities to teach their children the faith. The smallest of children can join in and anticipate the next time to say “Amen” or to fold their hands or to stand or sit down. They can be brought into the mystery and anticipation of the sacrament. Don’t forget—in church, in the Divine Service, God is serving the children as well. Through the word, He is nourishing and strengthening the faith He created in baptism. Remember, Jesus wants the children to come to Him so that He may bless them [Mark 10.13-16]. 16. Do you have a play area if my toddler is restless? We have several church books and Bible coloring books available for younger children. However, if a child is still restless we have an area off the narthex downstairs with toys and books. Often one of the members will be more than willing to be with the toddler(s) so you may be at the service. Feel free to ask an usher if you have questions or need help with child care. 17. Will you ask me to give you any money? Part of the service is an offering. As offerings are placed in the offering plates and presented at the altar, that is symbolic of the “spiritual worship” [Romans 12.1; 1 Peter 2.5] of our Christian lives offered in response to God’s goodness, grace and mercy. It is an outward sign of our inner spiritual dedication. The offering is not “half-time” it is an act of worship. However, we do not require that you give anything when you visit. The offerings are intended for the members to give them the opportunity to support and promote the preaching of the Gospel at Faith [1 Corinthians 9:14] and throughout the world. Of course, if you want to put something in the offering plate, we won’t refuse. 18. What should I wear if I visit your church? 19. Where are your restrooms located? Our historic building does have limitations and one of those limitations is that it is not handicap accessible. Our bathrooms are down the stairs, through the Bible Study room and through the kitchen. There you will find them off the hallway that leads out of the kitchen, in an addition to the original church building. 20. Where should I park when I visit? All of our parking areas are maintained by the City of Corning—we have on street parking up and down First Street. In addition, for off street parking there is a small lot across the street from the church off of Gaiss Lane. For the more adventurous, there is a municipal lot on the corner of Denison Parkway and Chestnut Street close to the McDonald’s parking lot. From there you can approach the church from the rear via the alley.